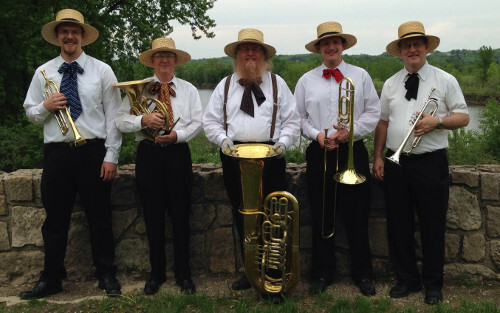 The Century Brass quintet is a traditional brass quintet with five musicians playing a mixture of brass instruments including two trumpets, a French horn, a trombone, and a tuba. Depending on the particular song, the trumpet players may play cornets or trumpets or piccolo trumpets. Some songs and styles also demand a different bass instrument so our low end may be either a tuba or a bass trombone. Music from many historical periods and musical styles is represented in the repertoire of the Century Brass quintet. Baroque music by Johan Sebastian Bach, Henry Purcell, Johann Pezel, Samuel Scheidt, Giovanni Gabrieli, etc. Operatic arrangements by Giuseppi Verdi, George Frederic Handel, etc. Orchestral transcriptions by Peter Tchaikovsky, Modeste Mussorgski, Edvard Grieg, Igor Stravinsky, Gustav Holst , etc. modern brass quintet pieces by Viktor Ewald, Arthur Frackenpohl, Malcolm Arnold, Robert Nagel, etc.